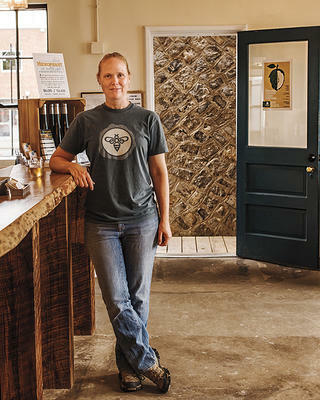 When I arrive at Blue Bee Cider in Richmond, Virginia, I find 43-year-old owner Courtney Mailey balancing five rungs up an 8-foot-tall ladder, trying to grab a dangling hose that two of her employees have lowered from a roof. After securing the hose and stepping back down, she runs off to maneuver a forklift, raising its prongs about 20 feet in order to lower the aforementioned workers from the roof. Clearly, Mailey is a hands-on sort of business owner. If her display of forklift driving isn’t evidence enough, the puffy white vest she’s wearing—stained with not one but two shades of earth-toned foam insulation—surely is. Unlike the infamously high-maintenance Marcos, however, there’s no doubt that Mailey is willing to get her hands dirty. She certainly has done so since taking possession of the four-building complex in April of 2016. The long-neglected structures, built in 1940, had been used by the city’s Department of Parks and Recreation since the 1990s as a sort of dumping ground for misfit office furniture and recreation equipment. The rooms were filled with three-legged desks, malfunctioning filing cabinets, beat-up Ping-Pong tables without nets, and deflated basketballs. Oddest of all were the sets of pink unicorn heads and rainbow tutus, likely used for some long-forgotten production at a nearby city-owned theater. Blue Bee founder Courtney Mailey. Despite the chaos inside, the property met most of Mailey’s criteria: She had been looking for an industrially zoned property with high ceilings to accommodate the cidery’s fermentation tanks, a little bit of land to plant some heirloom apple trees, and appropriate indoor space for a tasting room. “I feel like I’ve developed an eye for being able to see past all the rust and cracks and know it’s possible to turn something like this around,” says Mailey, who studied historic preservation and classical civilization as an undergrad at the University of Mary Washington in Fredericksburg, Virginia, and later worked as an administrator for the Virginia Main Street Program. The city first built stables here in the late 1910s, but the wooden buildings were damaged by fire in 1926. As part of the Works Progress Administration, workers constructed new stables and garages out of granite cobblestones, likely recycled from Richmond’s streets. Architectural historian Debra McClane, who served as a consultant on the Blue Bee project, says the pavers are a recognizable feature of many structures in Richmond’s public parks. They were also used in a similar stable complex, which the city still uses for storage, about a mile away. The entry to the tasting room at Blue Bee Cider. After Mailey parks the forklift, she joins me at one of the cafe tables in the cidery’s courtyard and offers the grand tour. The four buildings that make up the complex form a loose U shape, with the courtyard and a small parking area in the middle. A repaired chain-link metal gate, original to the complex, occupies the open end of the U, and a big sliding gate on one side of the property serves as the main visitor entrance. When Mailey purchased the buildings, weeds sprouted from cracks in the cement pavement and razor wire covered the fences. The two-story building that forms the base of the U originally housed mules, and then horses, on the first floor. The original pulleys, once employed to hoist bales of hay, still protrude from the exterior wall above the second floor. Now the space contains a potting room, a garage, a workshop, and a cider lab. From the potting room, filled with gardening equipment, we head up a flight of sturdy pine stairs. Mailey points out a weathered sign in block letters attached to the stair post at the top: “Keep Fire Away.” The former hayloft currently holds several curled-up hoses. “If I can get my hose collection under control, this will eventually be my office,” she says. The ciders are made from heirloom apple varieties. Here in the hayloft, as in the rest of the complex, shiny silver HVAC ductwork and electrical conduits contrast with the muted gray of the granite walls, giving the space an industrial look. As part of the application for state and federal historic tax credits, which Mailey used to help offset the $1.2 million cost of the project, that look had to be preserved. The most challenging aspect of the rehabilitation was cleaning and then repairing the heavy granite cobblestones. Because the stone was considered a character-defining feature for historic tax-credit purposes, the team had to restore the mortar to as close to its original shade as possible. The only problem was, after 75 years, no one knew the original color. Blue Bee is part of Scott's Addition, an old industrial neighborhood. 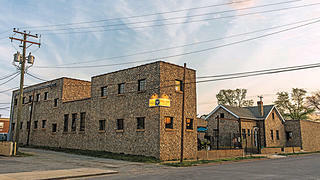 In a neighborhood filled with mostly one- and two-story redbrick warehouses, Blue Bee’s imposing granite walls stand out. Scott’s Addition, which sits five minutes off Interstate 95 and about 3.5 miles northwest of the Virginia state capitol, was named for 19th-century general Winfield Scott, who acquired the land as part of a dowry in 1817 when he married Maria Mayo, daughter of a prominent landowner. In the early 20th century, the city of Richmond annexed the parcel, railroad companies built train tracks, and Scott’s Addition thrived as a hub of light industry. The roughly 45-block area was added to the National Register of Historic Places in 2005 and still boasts its share of small manufacturers, but in recent years, developers have been converting the warehouses to loft apartments. However, the area is best known for its burgeoning craft alcohol scene. 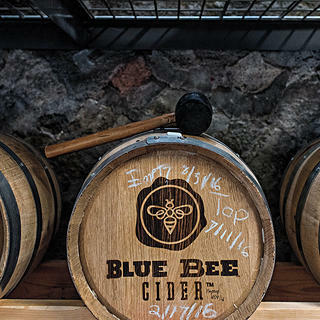 In addition to Blue Bee, there’s another cidery, a meadery, a whiskey distillery, and five microbreweries. Scudder, who has worked on several buildings in the neighborhood, says that 10 years ago you could buy an old warehouse for $20 to $30 per square foot. Today they’re going for between $60 and $80. Inside the tasting room and store. Cidermaker Manuel Garcia in the tank room. Mailey and I continue to the other side of the U, a 5,150 square-foot building divided into three rooms. 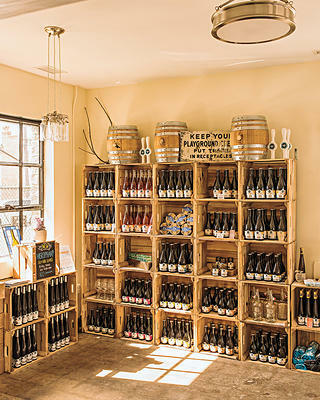 One contains a library of previously bottled ciders. Another houses dozens of white cardboard boxes filled with cider ready for sale. 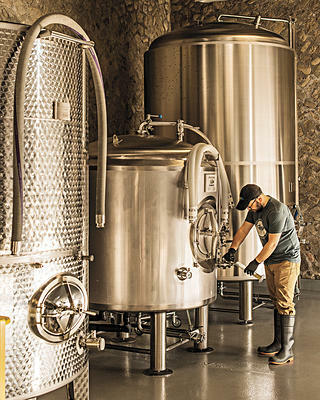 And then there’s the tank room, with its five 1,500-plus-gallon tanks used to ferment and blend, and two smaller tanks for chilling and carbonation. This is the lair of cidermaker Manuel Garcia, who at 28 has already been coaxing sublime flavors from apples for four years. Perhaps the most interesting characteristic of this building, which was originally used as a garage for horse-drawn carts and later automobiles, is its series of oversize doors. General contractor Scott moved three of the original wooden doors to another location in the complex, replacing them with glass-and-metal versions so visitors can see the activity going on inside the tank room. The relocated doors and the building’s other four garage doors were meticulously reconstructed, using the original hinges and rollers. Scott and his crew had to replace dozens of panels, employing a custom router bit to cut and then mate the edges of the tongue-and-groove-style boards. 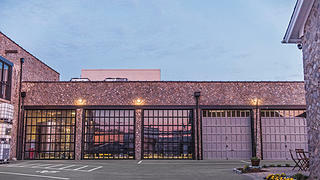 A mix of new and original garage doors on the tank room building. Mailey and I cross the courtyard to visit the complex’s final two buildings. One, a rectangular garage, was full of motor oil drippings—and a litter of kittens—when Mailey took possession of it. 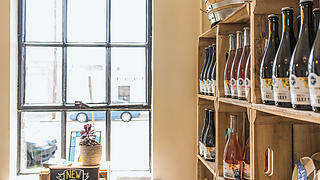 Now, the rehabbed 563-square-foot space accommodates tastings and special events. A small hallway leads to the final building, which holds the main tasting room and the cidery’s store. 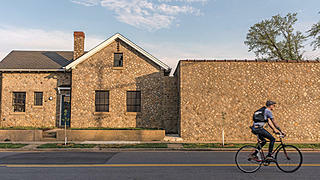 Half of this pitched-roof structure had served as a washroom for laborers, and its frosted windows still conceal its interior from passersby along Summit Avenue. The tasting room once contained showers, and its floor slopes slightly toward an old drain, now cemented over. Planks of yellow pine, reclaimed from saddle racks in one of the haylofts, form the base of the bar, which is topped with a polished slab of cherry. Joe Sugarman lives in Baltimore and is a frequent contributor to Preservation. His most recent story for the magazine was “Room and Board” in the Spring 2018 issue.